Today is the last day of Lawn Fawn release week, all the new things will be available tomorrow! 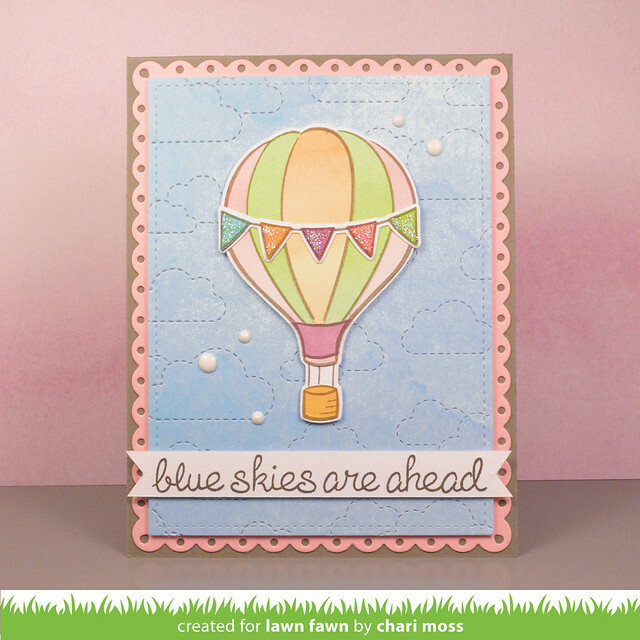 My card today uses the new Stitched Cloud Backdrop: portrait as well as one of the two new shades of cardstock. The new backdrop die will cut a panel that is 4.25 x 5.5 in size, perfect for an A2 size card but I wanted to layer some solid cardstock pieces behind so I used a stitched rectangle stackable die to cut my blue watercolor wishes paper before running it through with the backdrop die to create the fun stitched clouds. I cut the large fancy scalloped rectangle from the new ballet slipper cardstock and layered it with the cloudy sky onto a Narwhal cardstock base. 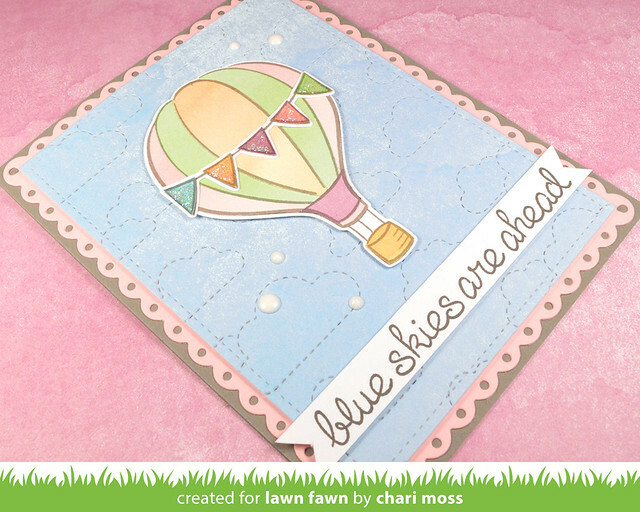 I wanted to show an older set a little love again so I dug out Blue Skies and paper pieced the hot air balloon using the Watercolor Wishes collection. I added some stardust stickles to the little banners and some white Nuvo crystal drops around in the sky to create enamel dots. The sentiment is stamped with storm cloud ink. Be sure to check out the Lawn Fawn blog for more projects with the new backdrop dies as well as the new ocean wave pop-up add on (which I unfortunately didn't get to use yet but I will very soon!). Such a lovely card. This new stitched cloud background is so versatile.